On 9 February, 2017, JSPS, JSPS Alumni Association of Thailand (JAAT), NRCT (National Research Council of Thailand) co-hosted the international seminar “Research for Sustainable Life”, in which a Japanese and a Thai speaker made presentations respectively under the topic “Sufficiency”. 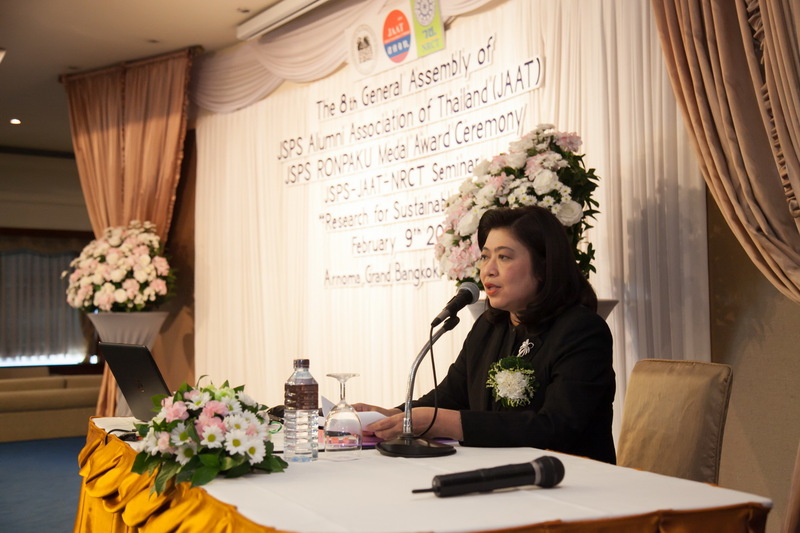 In the opening ceremony, Ms. Wiparat De-ong, Deputy Secretary-General and of NRCT, and Prof. Kuniaki Yamashita, Director of JSPS Bangkok Office, delivered address. 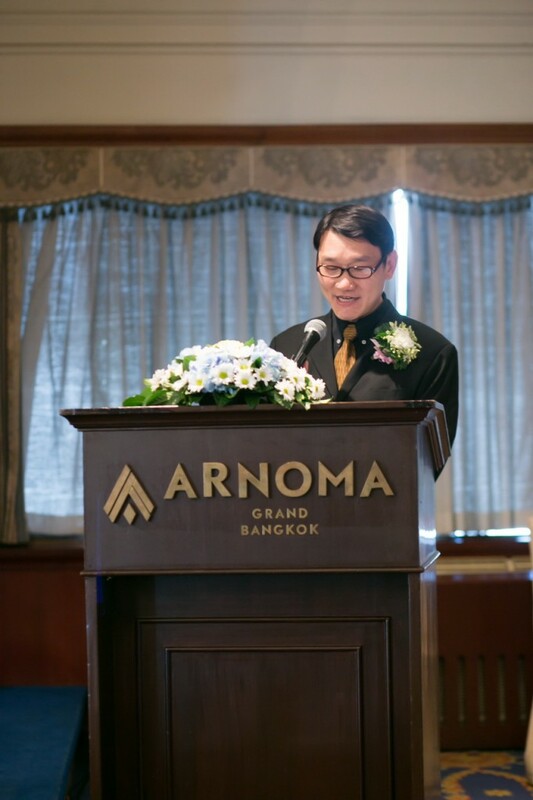 Prof. Yamashita mentioned in his address about further academic collaboration between both countries, with talking about cooperation among 3 organizations and 46 Japanese universities that have their branch offices in Thailand. In the seminar session, the first speaker, Prof. Dr. Hiroyuki Konuma, Professor and the Director of Meiji University ASEAN Center and Senior Advisor to the President of Asia Institute of Technology (AIT), made the presentation titled “Contribution of Sufficiency Economy Philosophy and New Theory of Agriculture to the Attainment of Food Security and Sustainable Society”. 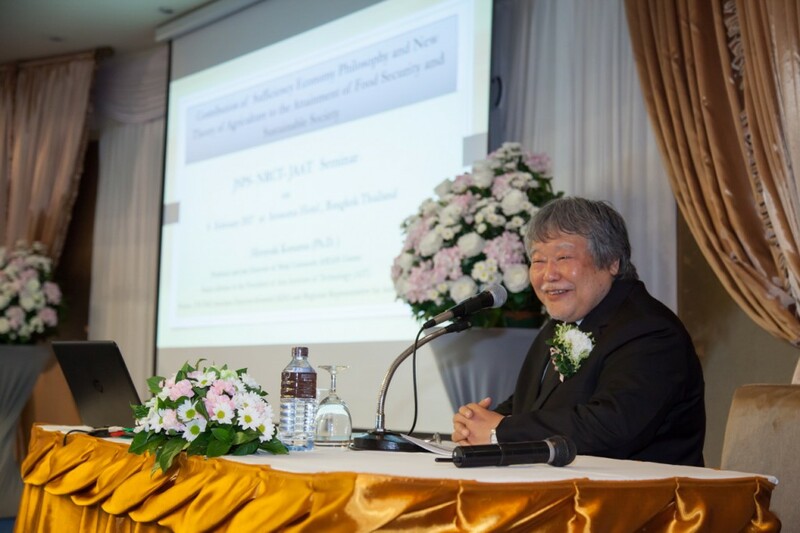 Prof. Dr. Konuma, who majored in agriculture and worked for United Nations (UN) Food and Agriculture Organization (FAO) as an Assistant Director-General and Regional Representative before, has met former king of Thailand, H. M. Bhumibol Adulyadej 2 times and talked about food security and bird influenza that occurred in Thailand in 2003. Prof. Dr. Konuma also introduced “Sufficiency Economy”, the idea of which was suggested by the king and is composed of 3 elements, Moderation, Reasonableness and Risk Management. 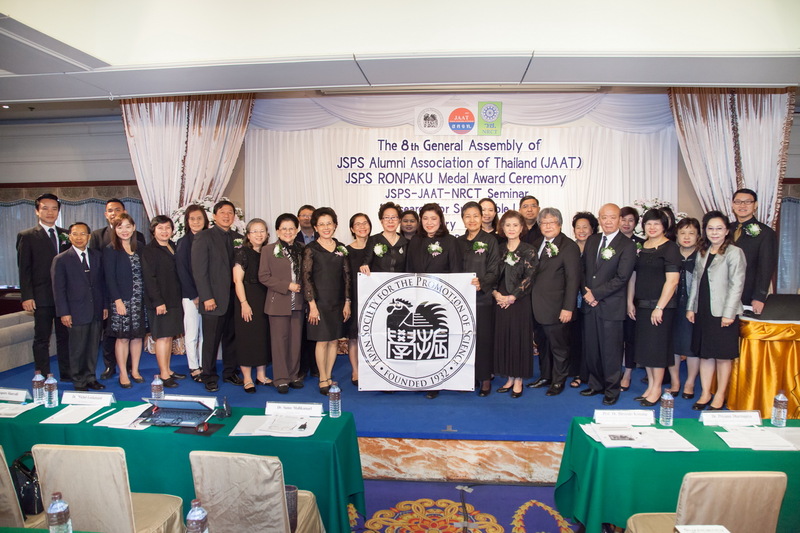 The idea not only spread over Thailand but also connects with Goal 12 “Ensure sustainable consumption and production patterns” that is one of Sustainable Development Goals (SDGs) adopted by UN in 2012, he said. Prof. Dr. Konuma concluded that we could learn a lot from the king’s philosophy towards sustainable society though we had various kinds of problems such as food security and climate change. The second speaker, Dr. Priyanut Dharmapiya, Director of Sufficiency School, Centre Foundation of Virtuous Youth, made the presentation under the title “Advanced Research in Sufficiency Social Science”. 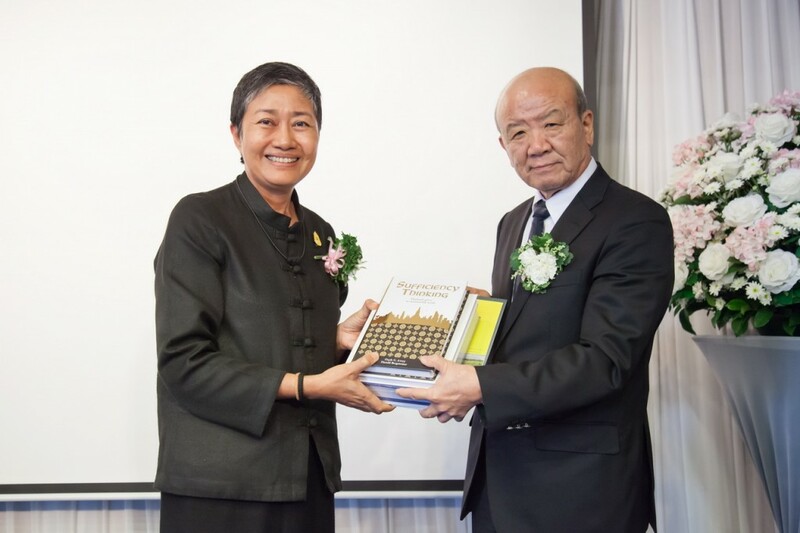 Dr. Priyanut obtained both her bachelor and master degrees at Tsukuba University and has been in charge of the projects related with “Sufficiency Economy” for a long time at the National Economic and Social Development Board (NESDB) and the Crown Property Bureau. 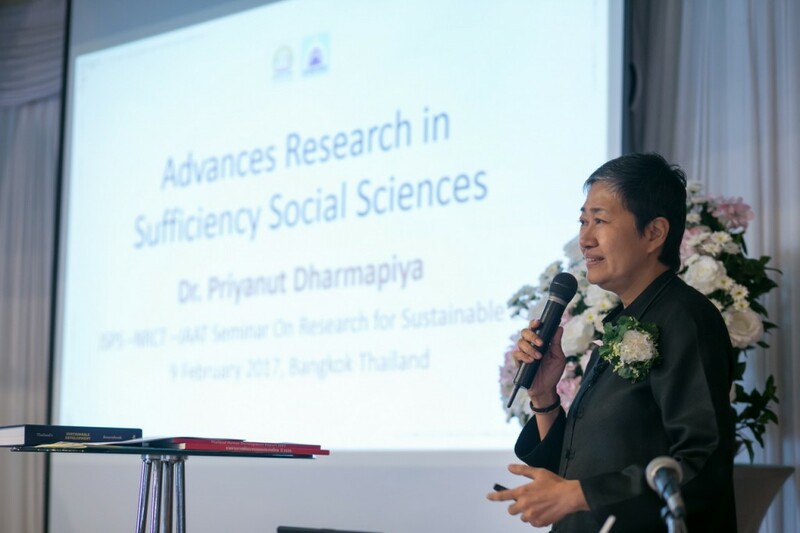 Dr. Priyanut explained that Sufficiency Economy Philosophy and the decision-making model based on it could help us to achieve sustainable development, speaking to such problems as forest degradation and poverty in Thailand. Covering SDG 4 “Ensure inclusive and equitable quality education and promote lifelong learning opportunities for all”, Dr. Priyanut also introduced activities of Sufficiency School that adopts Sufficiency Thinking and emphasizes students’ ability of thinking and acting. 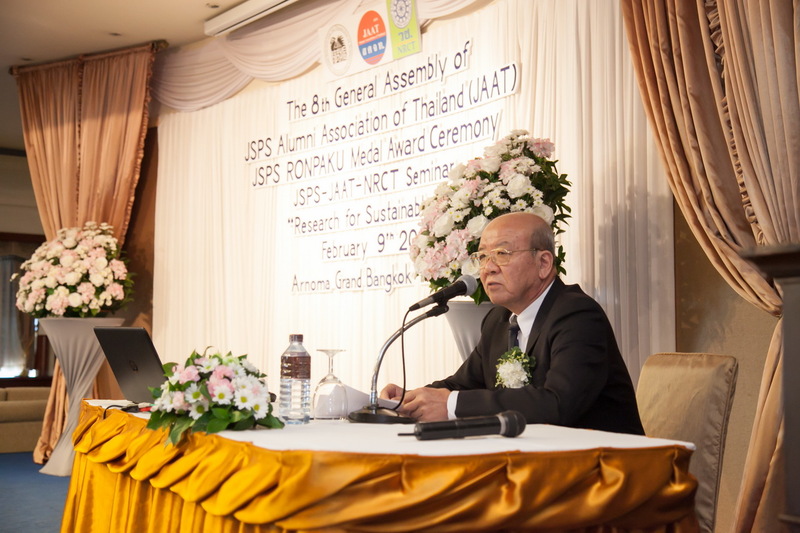 In addition, Dr. Priyanut mentioned the result of survey on the students’ character and performance. Some 50 participants, mainly Thai researchers, showed high interest in both presentations because the themes are well-known among Thai citizens.